The majority of iPhone's owners are looking for a way to unlock their iDevice to be able to use it in any company they desire which is useful for users that travel out side the US. This is how the whole "Jailbreak Community" was created anyways, a kid (George Hotz) wanted to use his brand new iPhone with another company that was cheaper than AT&T (if I'm not mistaken it was T-Mobile). Well this is always a hustle since Jailbreaking seems to be a easier thing to do since there is a Jailbreak tool for almost any kind of iDevice out there (except the Apple TV 3 Gen.) than there are unlock tools for any basebands. Anyhow this kind of unlock forces the iDevice to be Jailbroken and then unlock in many of the cases even though we have now the Gevey Sim Card or similar Sim Cards that the device does not have to be Jailbroken. People are always looking for devices that are Factory Unlocked, which are the ones that don't need any kind of tools or you have to be worry about updates damaging your unlock. This devices are hard to find and if you have the luck to find them, they may cost way more than a regular iPhone. For those of you that have acquired your iPhone thru AT&T which is my case and have had your iPhone for 2 years. 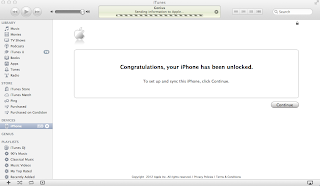 Then you are entitle of getting your iPhone Factory Unlock for free like I did. I heard that I could do this by calling the tech support at AT&T but was reluctant to do this. A couple of days ago I wasn't doing anything and decided to call them, and asked them for the unlock. They check my account and told me that I qualified for the unlock. The representative asked for my IMEI number and even though I had change the phone like twice and they didn't have the same IMEI number on my account they were able to change it, and sent me an email with instructions. The instructions were very simple: BackUp and Restore you iPhone. Those were basically the instructions. 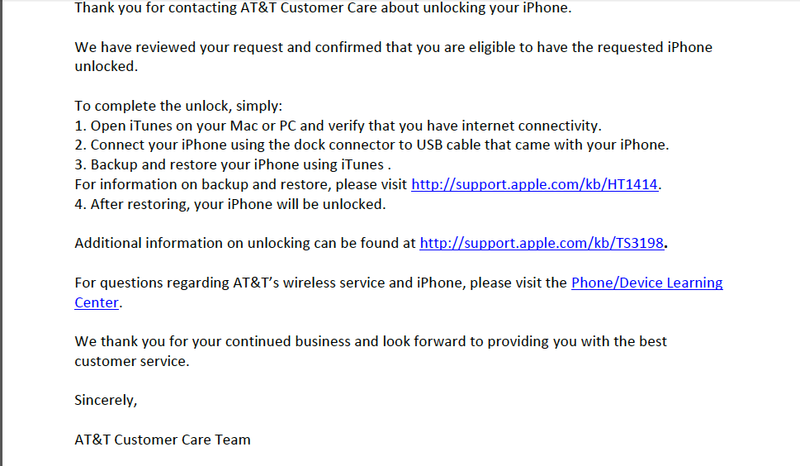 The email said that after that I would received a message from iTunes stating that my iPhone was Unlock. Eventually I did all this and it worked, I did receive the message that stated that my iPhone was unlock. The representative did tell me that the unlock could take up to 24 hours even though I received the message from iTunes. This is no the best way to get your iPhone Factory Unlock since you must have a contract for 2 years and then your contract have to expired in order for you to have a Factory Unlock. I just thought that they are many people just like me that didn't know this and their contracts have expired so we have the opportunity to do this. 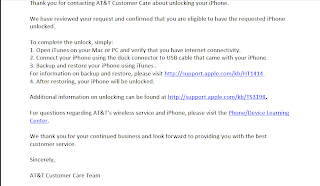 Update 9/26/12: if you have an iPhone and are in need of an unlock, and you are still in contract for another year or so. The best way to unlock it is by contacting @chronic via his business email will@chronicwire.com and give him your IMEI number as well as the company your phone came from. He will send you an invoice from Paypal with the price you must paid. He is very reliable and I have done my iPhone 5 and iPhone 4 with him. The prices varies depend on your carrier. The process take around 1-3 days to finished, please if you do use Chronic to do your unlock please be patient because he is handling all the emails by himself, thanks. I think this is the best way to unlock your iPhone if you are still under contract or just bough a brand new iPhone 5. Use Unlocking Mania. They have all countries iPhone unlocking Service at a very low price. Contact them they will provide you coupon. You can unlock your iPhone 4 by remote unlocking, it is both simple and safe. A lot of websites offer this unlocking service. I unlocked my iPhone at iphonelox.com, and found their service and support to be good. You can have a clear idea on how to unlock your iPhone using remote unlocking at http://www.iphonelox.com/…; this site gives you free instructions on how to unlock cell phones!! I unlock my iPhone 4, iphone 3GS and iPhone 3G using UltraSn0w. Hello guys. 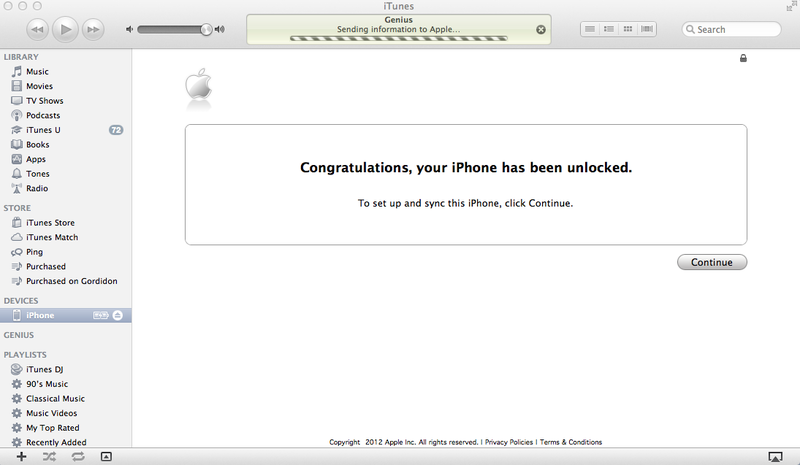 I have just gone through some useful information about the unlocking of an iphone. I found it better from others. You can also follow this link and get rid of your problem. @jayklint is true you can unlock your iPhone 4, 3G and 3GS with UltraSn0w but that just works for base bands; 1.59.00 for the iPhone 4 and 4.26.08, 05.11.07, 5.12.01, 5.13.04 and 6.15.00 for the 3G and 3GS, so what happen to the other, also that UltraSnow unlock is not permanent and you can't upgrade as easily as if Factory Unlock. @Salmanharneed that a good choice but there are restriction there cause it doesn't support iOS 6 with this last method I described you wont have that problem and will always be able to update to the latest software. @amandagoodspeed thanks for your words and you are welcome..
We offer iPhone Unlocking Service and also unlock any iPhone 2G, 3G, 3GS, 4, 4S and iPhone 5! Our professional iPhone unlocking Provide Permanent IMEI-based SIM unlocking service, all you need to do is to submit your iPhone IMEI number and your phone will be permanently unlocked within a few minutes. I did mine at Jailbreakhome.com. They provide the best unlock service I've ever got. Very fast and smooth process. I got the iphone factory unlock in a very cheap price. I'm really glad with the result. Good post...There are many such unlock service offered for an iPhone.I unlocked mine through Prounlocking.com permanently using their remote unlock service.This does not involve jailbreak and also does not depend on any baseband.It was fast and easy with their free instructions. Thanks for this great blog, Very well & insightful.